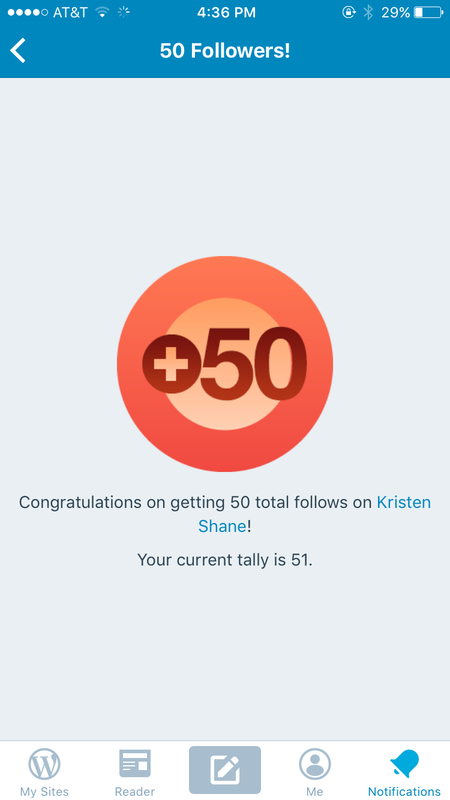 The notification that I received 50 followers on Kristen Shane was a welcome surprise that popped up on my phone today on the way to class. As I talked about here, views aren’t my purpose, but it is absolutely worth celebrating each person behind the numbers, and the growth is always encouraging to see. Thank you thank you for reading and taking the time to support me! Blogging is a courageous, creative endeavor and I’m truly blessed to have found an outlet that is everything I need it to be and more. I’m thankful for how blogging has allowed me a much needed space to reflect and focus on my faith, to flesh out the many ideas swimming in my head, and to record pieces of my life on my own little corner of the internet. So, thanks for being here, I hope you’ll decide to stick around! I also want to thank Ashley from QuintessentialHabits and McKenzie from StyledByMcKenz for being so sweet and tagging me in their blog awards this week! (Their posts bumped me up to 50 followers, and I found some great new blogs to follow through them as well.) I might try and tackle my own award post later this week. I’ve been focusing on one quote or scripture recently and after seeing this quote on Twitter, it’s been the one on my heart and mind this week. In conclusion, give some food to your thoughts and the things that you want to thrive in your life, and starve the things that are wasting your time and energy. As always, thanks for reading, and I hope you make today a good one. Keep up he good work and stay focused. Congrats on 50 followers!! That is so exciting 🙂 also, love your insights in your “food for thought” section. It helped me take a step back and look at the challenges I am facing, and what the bigger picture should be. Keep writing awesome blog posts!! Congrats Kristen! Keep up the great writing that you obviously inherited from your loving father.